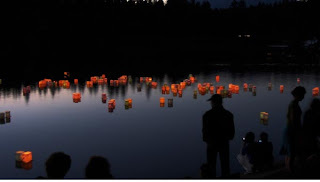 PeacePhilosophy Centre is going to support Veterans Against Nuclear Arms, Lantern For Peace and Vancouver Save Article 9 to present the Hiroshima Memorial event--Peace Lanter Ceremony on August 6th at the South Pond of Central Park, Burnaby city. Speakers, including the Mayor of Burnaby city will give short speach on peace and the memorial of Hiroshima. There will be volunteers to teach people to make lantern, and the lanterns, carring the hope of peace, will be sent on water at the end of the ceremony. The event is free and open to everyone. Please jion us to memorize the 63 years anniversary of the Bombing of Hiroshima and express our wishes for future peace. Please see the following information for more details. If you have any question, please contact Arc Han by Arc@peacephilosophy.com or phone (778-855-5344) for more details. Venue: South Pond, Central Park, Bunarby. How to get there: Parking North side of Imperial, Just E side of Boundary Road. The South Pond is about 30 meters north from Imperial St. Presented by Veterans Against Nuclear Arms, Lantern for Peace and Vancouver Save Article 9. PeacePhilosophy Centre is going to support Vancouver Save Article 9 to host an Atomic bomb and Article 9 quilt exhibition in this year's Power Street Festival. A hand-made quilt with Article 9 sewed on it will be presented in this exhibition. And there will be more than 40 boards to present the tragic events happend in August 6 and 9, 1945. Children are also welcome to come to the exhibition to watch some animes. The exhibition is free and everyone is welcome. Please see the attached information below for the venue and time. If you have any question, please contact Arc Han by Arc@peacephilosophy.com or (778)-855-5344 for more detail. You may have some knowledge about tragic events done by nuclear bombs at Hiroshima and Nagasaki in 1945, but have you heard about the Tokyo Raid in 1945? Even Japanese have not been informed much about it. This spring, I watched its documentary stories on TV and the dramas urged me to visit the Center of the Tokyo Raid and War Damages to learn what exactly happened in the downtown of Tokyo. About 300 American B-29 bombers carried out their air-raid on downtown of Tokyo early on March 10th 1945. They dropped over 320 thousands of their incendiaries and towns were covered with furious fire and people burned to death. After the air-raid, there were tons of bodies piled up all over the towns: death by fire, drowning and carbon monoxide poisoning. Some of them were already carbonized. It was estimated that the 2-hours air-raid destroyed a quarter of Tokyo and killed over a hundred thousand　people and this atrocious indiscriminate air strike was previously unseen in the history of war. In addition, most victims were women, children and the elderly who were helping each other to keep their lives while most men were being conscripted into the war. Statue of mother and child by Shin Kohno "In Time of War"
To tell the truth of the Tokyo Raid to present and future generations, Katsumoto Saotome, the director of the center, has started to collect artifacts and documents about the Tokyo Raid with many supporters since 1970. Although public plans for a Memorial Hall of Peace were canceled, Mr. Saotome and many members of the Institute of Politics and Economy launched the grass-roots campaign for collecting donations to build the centre. As a result, with about one hundred million yen (one million fifty thousand dollar) from over 4000 donors, the Center of the Tokyo Raid and War Damages was built in 2002 March 9th. Furthermore, in March 2007, the building was extended to have more spaces for providing lectures and displaying exhibit. This center was a three-story building made of bricks and located in one of the worst affected areas by the air-raid. On the first floor, I saw its reception, study rooms and documents. Then, I went up to the second floor and watched documentary film, “The Tokyo Raid” made in 1978. The film showed incendiary bombs falling like rain and the towns being covered with floods of fire. One of survivors said, “Even though I pulled up many bodies from the river, I saw another many bodies at high tide next day. I was wondering where so many bodies came from….” In addition, the documentary explained the strategies of the indiscriminate bombing campaign done by the US Army. Air-raids had targeted only on military facilities, but indiscriminate air strikes started when General Curtis E.Lemay was appointed to be a commander. According to the documentary, he rejected to be interviewed by the film makers, because he wanted to forget the war. He, however, allowed Japanese staff to shoot his medal awarded in 1964 by the Japanese Government for his contribution to trainings of Japan Air Self- Defense Force. After I finished watching the film, I saw many pictures, drawings and a damaged area map showing cruel scenes during and aftermath of the air-strikes. Some of pictures were taken by Koyo Ishikawa, who was a photographer of the Tokyo Metropolitan Police Department. Putting in his life in danger, he kept rejecting demand of GHQ to give the pictures to them. On the third floor, many kinds of artifacts were displayed, such as broken peaces of incendiary bombs, victim’s belongings and wartime documents. In addition, I learned about wartime education in the “Children and War” room. In 1941, the Kokumin Gakko ( National School) started, and students were demanded to support the imperial family and to be a loyal subject. To brainwash students, even cards for playing game were designed to enhance their nationalism. The next room, which was my favorite section, contained many children’s books for peace, books written by Katsumoto Saotome and his approaches for peace. I also enjoyed reading many messages for peace from famous people: Sayuri Yoshinaga( Japanese actor), Osamu Tezuka( creator of an animation, Astro Boy) and Chihiro Iwasaki( painter for children). This section played a great role for me not to drag fear, angry and grief that I felt in the process of learning about the Tokyo Raid and made my feelings change into quiet to think about peace. The next day, I went to the Kototoi Bridge, which was about a five-minute walk from Tokyo Asakusa Kaminarimon Gate and one of symbolic places of the Tokyo Raid. During the indiscriminate air attacks, a massive amount of people ran to the bridge from both east side and west side at the same time to escape from furious fire, so they could not move anywhere on the bridge. Some of people were covered with fire and others jumped into the Sumida River. Then, a large number of bodies were left not only on the bridge but also in the river and on the banks. The current banks of Sumida River were surrounded by many trees which provided comfortable shades for people who enjoyed walking, jogging and cycling. I also saw many homeless people gathering on the banks. When I arrived at Kototoi Bridge, I prayed for victims, “I’m sorry, please rest in peace,” but I could still not believe the tragic events happened around here. On the way back where I came from, I found the memorial for the Tokyo Raid victims, which said, “Ahh...the Tokyo Raid…Please rest in peace….” I suddenly had feelings that I could not explain and dashed back to the Kototoi Brigde and I prayed for victims again from the bottom of my heart.